Petitgrain Essential Oil (Citrus Aurantium Amara) - Sweetgrass&Rain Inc. Native to Southeast Asia, the bitter orange tree that provides Petitgrain Essential Oil, now grows throughout the Mediterranean and sub-tropic areas worldwide. Originally the oil was produced from the unripe oranges when they were the size of cherries; in fact its name comes from petit grain, which in French means 'little grain'. This proved uneconomical and thus began its extraction from the leaves and twigs of the tree instead. The oil is used extensively in perfumery and cosmetic preparations. 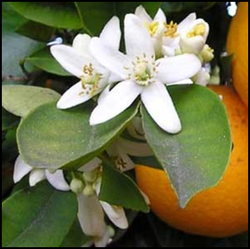 Petitgrain Essential Oil smells like orange blossoms with sharp herbaceous notes and a bitter undertone.